One could say two former Republican secretaries of state, Messrs. Baker and Shultz, are naive and badly informed, but their proposal for a carbon tax smacks of fools rushing in. Their proposed carbon tax is part of a proposal by the Climate Leadership Council. This “carbon tax” is a tax on CO2 emissions, based on the supposed need to cut CO2 emissions to prevent a climate catastrophe. But, a “carbon tax” is fundamentally a bad proposal for several reasons. First, Baker and Shultz propose to return a dividend to the poor, because it’s the poor who are hurt the most by any attempt to cut CO2 emissions. I.e., the poor pay a higher proportion of their income for electricity and energy than do wealthier people. This is pie-in-the-sky reasoning, because legislators will eventually see the tax as an opportunity to increase government revenues and spending. That’s the real-world outcome of any such dividend proposal. Second, it tries to entice the Trump administration into establishing an import tariff if other countries don’t establish a tax on carbon. This is unnecessarily confrontational, while getting 195 countries to establish the same price on carbon would be an impossibility as each country would attempt to establish a price that would benefit them in international trade. Thirdly, Baker and Shultz want to begin with a tax of $40 per ton, which is higher than the Obama administration’s social cost of carbon (SCC) of $36, while proposing that a panel should review the tax in five years to see whether it should be increased. Extreme environmentalists who clamor for cuts in CO2 emissions won’t agree to the Baker and Shultz proposal because they want money to be spent on such things as wind and solar and energy efficiency. This was demonstrated in Washington State when a carbon tax was voted down, largely because extreme environmentalists opposed the proposal because it was revenue neutral and money wasn’t being spent on their pet projects. In addition, it’s important to understand that models from which the social cost of carbon are calculated provide widely different answers depending on the assumptions used. CO2 could provide benefits, rather than costs. The choice of the discount rate has a huge effect on the outcomes generated by the three computer models (DICE, PAGE and FUND) used for determining the cost of carbon. The Equilibrium Climate Sensitivity (ECS) also affects the outcomes. Results from the DICE, PAGE and FUND models are shown in the graph. FUND model results (green) indicate there are benefits from carbon dioxide and that there could be no SCC, or even a negative cost. 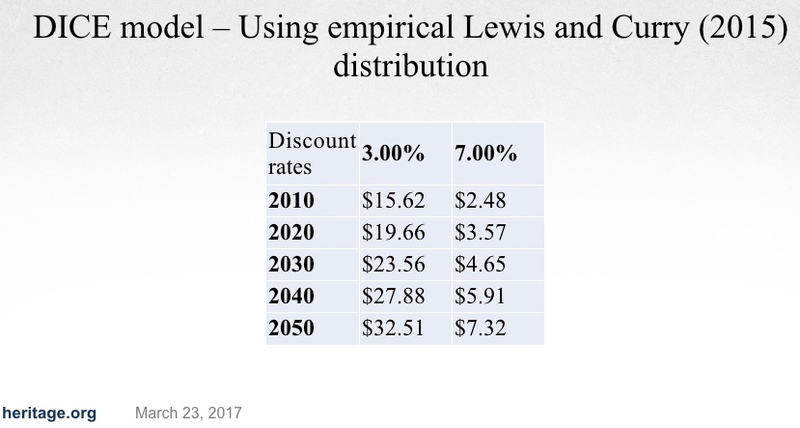 The assumed discount rate has an important effect on the model’s results. The differences between a 3% and a 7% discount rate are shown in the tables below. The Office of Management and Budget (OMB) recommended a 7% discount rate, while the Obama Administration used 3% when determining its SCC of $36 per ton. The first table below uses an outdated ECS, while the second uses a more recent ECS. Both charts show the difference between a 3% and 7% discount rate. In both examples, the cost of carbon is much lower when a more realistic 7% discount rate is used. 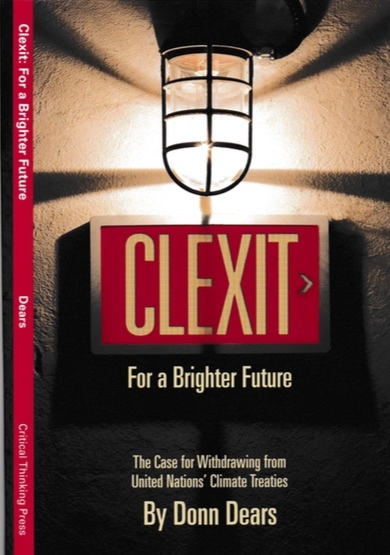 As established in the book Clexit, it’s impossible to cut CO2 emissions enough to stop any climate catastrophe, even if CO2 has some effect on climate change. Cutting worldwide CO2 emissions 50% by 2050 is impossible. Cutting US emissions 80% by 2050 is also impossible …. unless we accept returning to a lifestyle of the 1800s where horses were the main form of transportation, and air-conditioning, air planes and MRIs were unavailable. These targets are impossible to meet, therefore, Messrs. Baker and Shultz are asking Americans to sacrifice their living standards for an impossible goal. Furthermore, the evidence shows that the social cost of carbon (SCC) is small and possibly negative, i.e., beneficial, indicating there is no need for putting a price on carbon. Thanks. One more good piece. Love the title. Also enjoyed your interview at the lake yesterday. Thanks for another excellent article. The title says it all, don’t they realize that among other problems, a carbon tax would have an extremely negative impact on every business that needs energy to produce a product since it would raise their costs and make them less competitive in the international business world. Of course this would favor imports over US made goods. Time for 2017 economic thinking. Thanks. It would definitely hurt American made products, and that’s why countries would try to set their cost of carbon to give them an advantage. Quite apart from the foolishness of the carbon tax is the fact that there would be no benefit whatsoever. Many thanks. I agree wholeheartedly. Who wants to drive a 1978 chevy blazer today even a brand new one? Carbon tax never could be an obstacle against driving it. Efficency is strong reason to put this car aside forever. Just saying.